KTMU, has the most developed campus in Central Asia, and accepts students not only from Turkic-speaking countries, but also from other countries and all over the world; at KTMU there are BA, MA and PhD programs, high schools and institutes, which provide their services to the business environment and society. In compliance with the organizational purposes of the university, students are trained in a Turkic environment which is based on common cultural values, and on a sense of unity, identity, solidarity, love, and respect for increasing brotherhood and friendship. Special attention is paid to the training of professionals who will seek employment opportunities in the period of globalization, and who will make contributions to the economic development and to the prosperity of the countries. KTMU, has the most developed campus in Central Asia, and accepts students not only from Turkic-speaking countries, but also from other countries and all over the world; at KTMU there are BA, MA and PhD programs, high schools and institutes, which provide their services to the business environment and society. In compliance with the organizational purposes of the university, students are trained in a Turkic environment which is based on common cultural values, and on a sense of unity, identity, solidarity, love, and respect for increasing brotherhood and friendship. Special attention is paid to the training of professionals who will seek employment opportunities in the period of globalization, and who will make contributions to the economic development and to the prosperity of the countries. KTMU which has graduated about 6000 specialists, is a university with a strong information and technology database, and with modern educational programs that are based on high technology and a physical infrastructure . The University serves all strata of society and decidedly continues to make contributions to world of science. Our university, as one unit, places mankind at the forefront of its activities in light of the principles of a creative attitude to the environment, and service-awareness. The University constantly and purposefully continues the way it started due to the strength it received through the principles of Ataturk and the inheritance of Manas to be an international brand in education and the most competitive, world level university. From the beginning of its educational and training activities(1997), KTMU has continued to grow and develop in the spirit of innovation. It is becoming a modern local university with emphasis on internationalization and on improving the quality of education and international accreditation in terms of the Bologna Process. 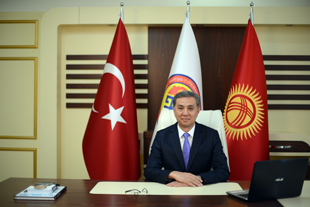 We expect that by 2020, our university will become an international brand in education; an institutional center of gravity, and will be an authoritative and exemplary institution of higher education in terms of international relations, cooperation and internationalization; it will become a heritage for society and business; a powerful force that will unite and stimulate to the development of Turkic world countries, and also will make invaluable contributions to world science.